Watch out! Here there be dragons! 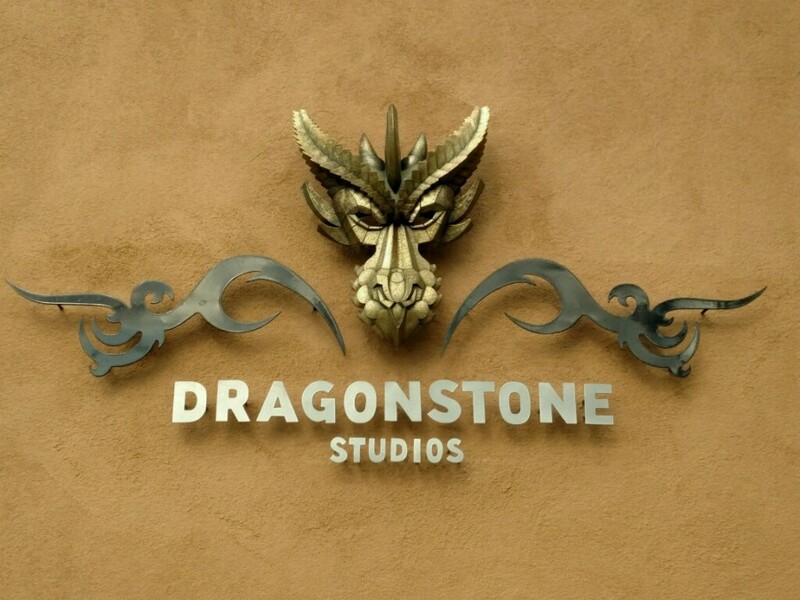 "Here" in this case refers to Camino Alire, and the former Desert Academy, which building I bought a couple of years back and converted to Dragonstone Studios, low-cost studios for aspiring artists. It's taken longer than I thought (a lot of repair and restoration was needed first), but we finally got up a proper sign. I love it, and hope you do as well. The sign is the work of one of those aformentioned aspiring artists, the sculptor and metalworker TYLER EUGENE SMITH. Tyler is also the guy who makes the Alfies every year out of old hood ornaments, and who created the amazing Beast Head that welcomes patrons inside the door of the Jean Cocteau Cinema. And wait till you see what he's making next... it will blow your minds. Meanwhile, drive down Camino Alire, and admire his latest. I attend Desert Academy currently, and I think that it is amazing what you've done with that old location. The sign looks great! Holy Smokes! That is EXQUISITE! I'm a Smitten Dragon Kitten! That looks amazing! Sante Fe is now on my Bucket List. Really cool to see all the things GRRM is doing to give back, invest in his community. That's impressive. I'd fully expect it to ask me a riddle before allowing entry. Well done! Tyler Eugene Smith. Perfect name for your metal artist. I think that's the best sign on a building I've ever seen! LOVE IT!